Francis Hans Johnston, known as Franz or Frank, apprenticed as a jewelry designer with Ryrie Bros. of Toronto in 1904. He studied during the evenings at the Central Technical School and the Ontario College of Art under William Cruikshank, Gustav Hahn, and G. A. Reid, while working as a commercial artist with Brigdens. In 1911 he worked at the commercial art firm Grip Limited in Toronto, where he met future Group of Seven members J.E.H. MacDonald, Arthur Lismer, and Franklin Carmichael. The following year, he went to Philadelphia to study at the Pennsylvania Academy of Fine Art and then worked with the design firm, Carleton Studios in New York, returning to Toronto in 1915. Johnston was commissioned to paint the home front during the First World War for the Canadian War Memorials Fund in 1918. During evenings and weekends he sketched Ontario’s Royal Canadian Air Force training camps including aircraft in various manoeuvres, some of which he developed into paintings. In the late summer of 1918, he travelled to the wilderness of the Algoma region near Sault Ste. Marie with artists Lawren Harris, MacDonald and art patron Dr. James MacCallum. Johnston’s work from these trips caught the interplay of light, colour and pattern in the woods in a decorative style, with an emphasis on flat planes of colour. In Fire-Swept, Algoma (1920) patches of blues and greens delineate the hills in the background, while the remains of a burnt forest are detailed in the foreground. In May of 1920, a group of painters including Johnston exhibited as the Group of Seven for the first time at the Grange in Toronto and were hailed as developing a truly Canadian movement. In December 1920, Johnson mounted the first of many independent exhibitions at the Eaton’s of Canada Gallery where the press praised his handling of light. In 1921 he moved to Winnipeg to become the Principal at the College of Art and Director of the Gallery until 1924 when he returned to Toronto to teach at the Ontario College of Art, the same year that his formal associations with the Group of Seven ended. Johnston was invited to Eldorado on Great Bear Lake, NWT, where he spent six months in 1939 sketching both the landscape and activities of northern aboriginal peoples. Upon his return, he settled in Wyebridge, Ontario, converting the village hall into a home and studio. He travelled regularly to northern Ontario to paint, and made his last trip into the Nipigon territory in 1946. During his last summers he painted pastoral subjects in Quebec, Baie St. Paul, villages in the Laurentians and the Ottawa Valley. Born in Toronto, Ontario, the son of Irish parents, Hans Hamilton Johnston and Mary Elizabeth Roderick. He was educated at the Givins Street School, Tor., Central Technical School under Gustav Hahn and, Central Ontario School of Art under Wm. Cruikshank and G.A. Reid. He then apprenticed with Birks as a jewellery designer and at Brigden’s in Toronto. Following his apprenticeship he joined Grip Engraving Co. in 1908. In 1910 he left Toronto for the U.S. where he continued his studies. He attended the Pennsylvania Academy of Fine Art under Hale and Garber. Moving to New York he worked for the Carleton Studios. He returned to Toronto briefly in 1914. Was back in NYC with the help of Dr. McCallum. He returned to Toronto permanently to live in 1915. In 1918 Johnston was commissioned by the Canadian War Memorials to record the activities of Canadian flying personnel training for overseas duty. During this period he produced seventy-three (or more) works including water colours, temperas, and oils. Many of these paintings although of a documentary nature were brilliantly created through masterful composition and colouring (see Check List Of The War Collections by Major R.F. Wodehouse-NGC-). Johnston’s paintings are among the finest in the war collections. Following his service with the Canadian War Memorials he returned to Toronto where he probably spent some time at the Studio Building. In 1918 he accompanied Lawren Harris, J.E.H. MacDonald, Dr. James MacCallum in their first box-car trip to Algoma. This region of northern Ontario was an area of beauty in autumn. The trees of gold, yellow, and crimson covering the majestic mountains and edges of the lakes and rivers moved the artists to create some of their finest canvases. Johnston returned to Algoma in 1919 with Jackson, MacDonald, Harris and Dr. MacCallum who probably joined them later. This group went again in 1920. Johnston made scores of drawings and paintings of Algoma but few of them were reproduced in Cana­dian art history books with the exception of his Fire Swept, Algoma (NGC Coll. ); God’s Country (Mr. & Mrs. J. Loeb); In Algoma and Northern Cabin. In 1920 Johnston became a founding member of the Group of Seven (others were: J.E.H. MacDonald, A.Y. Jackson, Frank Carmichael, F.H. Varley, Arthur Lismer, Lawren S. Harris) and he exhibited in their first exhibitions but in 1922 his association with the Group of Seven ended. They had become a target of attacks by critics and somehow their group spirit seemed to limit Johnston from doing what he wanted to do. He was every bit as eager to express his love of the Canadian wilds as they were but he wanted to paint in a less controversial style. Johnston held a solo exhibit of his work at the T. Eaton Company in December, 1920, when The Mail & Empire noted, “The position of Frank H. Johnston, A.R.C.A. among local artists is unique. Mr. Johnston is always classed as one of the much discussed ‘group of seven,’ but he has never got out of touch with the picture lovers who cannot quite get the viewpoint of his ultra-radical companions . . . . He has the secret of the living, vivid coloring of the Northland, and catches the feeling of the wild spaces.” Johnston left Toronto when he was appointed Principal, the Winnipeg School of Art. He kept up his activities as a painter and held an exhibit of 326 of his paintings at the Winnipeg Art Gallery of which Arthur Stoughton of the Free Press noted, “The greater number of the pictures are done in tempera, although this show presents evidence of the versa­tility of this man. He seems to have tried every color medium with good results. Here, in No. 304, is a massive oil painting with all the solidity which that material may present. Here, in No. 60 and in 280, are the wettest of transparent water colors, composed of washes of most elusive tints, devoid of outline. Then there are watercolors, as in No. 281 done in that method of broken color, dear to the heart of the impressionist or pointillist, in which spots of pure color put side by side blend in the eye of the observer. Again there are some dozen pastels which have a three-fold interest – first, from their good quality, second, because they present the artist’s first impressions of Winnipeg, and, third, as being his first essays in this medium.” In December of that year Johnston held another exhi­bition of his paintings particularly of Western Canada which were described as having the stimulus of the great spacious plains, magnificent cloud effects, glowing sunsets and enveloping sunshine. He was principal of the Winnipeg School of Art from 1920 to 1924 and by 1927 was back in Toronto where he became principal of the Ontario College of Art. About 1926 he changed his name from Frank to Franz because he was told by a numerologist friend in New York that the name Frank would never bring him success. Johnston wrote down the name Franz (name of a community east of White River, Ont.) and his friend told him it was an excellent choice. His canvases from then on were signed Franz Johnston. He was principal of the Ontario College of Art from 1927 to 1929. He exhibited his work throughout his career with the Ontario Society of Artists and the Royal Canadian Academy as he was a member of both societies (O.S.A.) (A.R.C.A.). In 1931 the Simpson’s Fine Arts Gallery created a new Franz Johnston Room for the express purpose of selling his paintings. 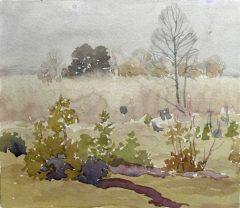 Johnston established a summer school of art at Georgian Bay (1930-40) where he was closer to that part of Ontario he loved to paint. In 1940 he closed his summer school and settled at Wyebridge in the same region. He began his trips into the Far North in the thirties and his work of this period was exhibited at several galleries including the Malloney gallery in Toronto. In 1938 Augustus Bridle in The Toronto Star noted Johnston’s exhibit at Malloney’s as follows, Canada’s farthest-north regular painter has for three years brought the land of crackling sub-zero, shivering spruces, and truculent huskie dogs into picture shows here . . . . What he has already painted of actual life in the Nipigon Country, as shown in this super-brilliant, intimate picture-saga at Malloney’s, is to him a mere prelude to what he intends to paint of Canada’s so-called ‘lost frontier.’ In 1939 he was commissioned by Gilbert Labine (Vice-Pres. of Eldorado Gold Mines) to go to the Canadian Arctic to paint nature, trappers, miners and native types in all seasons and after five months completed 100 sketches. Working in 35 to 40 below zero weather, he mixed his pigments, which had become like jelly, with pure tur­pentine. When he painted he covered his hand in a lumberman’s sock through which he manipulated his brush. Many of these works were exhibited at Malloney’s in December of that year. In 1940 he completed a large canvas entitled Shack In The Woods which he considered his masterpiece. He took it to a Toronto art dealer to sell and was in the process of dickering for the best price when a man (from New York) entered the gallery and asked Johnston how much he wanted for the painting. Johnston stated 850 dollars and the man purchased the work on the spot. Later reproductions of this painting were sold by the thousands with Johnston receiving no royalties from their sales. In 1942 he exhibited his work at Eaton’s, particularly scenes of the Wyebridge area, also some arctic paintings. 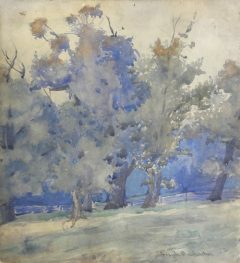 He again exhibited at Eaton’s in 1943 when Augustus Bridle found in his paintings Green-blue skies and lavender snows; blue snow-wraiths in the shadow against a blaze of early morn golden light; ravishing snakes of water as opalescent as rainbow-backed beetles; tousles of brushwood that look like jackpine or tamarac because painted so vividly . . . . These are a few of the Wye-fantasias. Of the eighty paintings he exhibited, fifty percent were sold within three weeks. They ranged in price from fifty to one thousand dollars each. In 1948 Johnston moved from Wyebridge to Midland, Ontario, but not long afterwards suffered a stroke. His paintings were in popular demand until his death. In July the Owen Sound Sun-Times noted his passing as follows, It may be said that, in a sense, Franz Johnston dedicated his professional life to Canada, for he had a deep appreciation for what this country had to offer. This sense of dedication was exemplified in his works. He painted Canadian things because he knew them best and he knew them best because he chose to live and work among the scenes and the people he portrayed . . . . He will be long remembered for his long-established summer art school on Georgian Bay. Here he not only created some of his own most famous paintings, but also guided the steps of many other painters along the pathway to success. The bulk of Johnston’s paintings still in his possession at the time of his death were purchased by Laing Galleries, Toronto. A plaque was unveiled by Mrs. John Schofield (formerly Mrs. Franz Johnston) on the grounds of his former residence at Wyebridge, Ontario on September 18, 1963. The Roberts Gallery, Toronto, held an exhibition of his work during the same year. Johnston illustrated and did decorations for a number of books. He is represented in the following public collections: Saskatoon Art Centre, Sask. ; Winnipeg Art Gallery, Winnipeg, Man. ; London Public Art Museum, London, Ont. ; Art Gallery of Ontario, Tor., Ont. ; McMichael Conservation Collection, Kleinburg, Ont. ; National Gallery of Canada (General Collection, and War Collection as mentioned above); and probably other public collections, also the following private collections: J. G. McKurdy, Regina Sask. ; Arthur Cutten Jr.; Mr. & Mrs. Jules Loeb, Hull, Quebec; formerly in the collection of the late Dr. Tait Mackenzie; Franz Lawren Johnston (his son) Grimsby, Ontario; others of his surviving relatives; William G. Street, Richmond Hill, Ontario. At the time of his death Johnston was survived by: his wife (now remarried); four children – Frances-Anne Johnston, A.R.C.A. (wife of Franklin Arbuckle, R.C.A.) Toronto; Mrs. James Stevenson (Toronto); Paul Roderick (an artist who paints under this pseudonym); Franz Lawren Johnston (see above); a brother Harry Johnston (Toronto). A retrospective exhibition of his work was organized by his son Paul at the Rothman Art Gallery, Stratford, Ontario, and opened in September, 1970. Paul Roderick is also preparing a book on his father. 1906- Worked as a catalogue illustrator at Brigdens Ltd. Here 5 of the 7 founding members of the Group of Seven met; Johnston, Fred Varley, Arthur Lismer, J.E.H. MacDonald, and Franklin Carmichael.